A small, cakelike bread that can be made with a variety of flours and often contains fruits and nuts. Most American-style muffins fall into the quick bread category and are leavened with either baking powder or baking soda. The yeast-raised type, such as the English muffin, is generally finer in texture. These small breads are usually made in a muffin pan (also called muffin tin), a special baking pan with 6 or 12 cup-shaped depressions that hold the muffin batter. Each standard muffin cup is about 2 1/2 inches in diameter. There are also giant muffin pans with 3 1/4-inch cups, miniature muffin pans (gem pans) in which the diameter of each indentation is 1 1/4 to 2 inches and muffin top pans, which are about 4 inches in diameter and only 1/2 inch deep. Muffins can be sweet or savory and, though they were once considered breakfast or tea fare, are now also served with lunch and dinner. A special metal baking pan, sometimes referred to as a muffin tin, with 6 or 12 cup-shaped depressions. Most often this pan is made from aluminum. Giant or Texas-size muffin cup is about 3 ½ inches in diameter and holds 5/8 cup batter. Miniature muffin cup is about 1 1/2 to 2 inches in diameter and holds 1/8 cup or 2 tablespoons batter. Muffin-top cup is about 4 inches in diameter but are only 1/2 inch deep. Substitute another size muffin cup for original size listed in recipe. If substituting a larger size muffin cup the recipe will yield fewer muffins and if using smaller size muffin cup the recipe will yield more muffins. The bake time will be changed also. 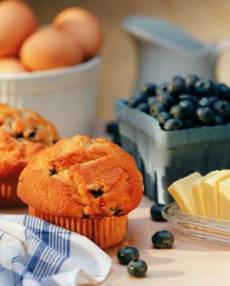 Bake a larger muffin longer than the original time and smaller muffins a shorter time. Grease muffin cups by spraying each cup with no stick cooking spray or using a paper towel dipped in shortening to grease each cup. In a large bowl, oil (or melted butter) and egg are beaten together to form an emulsion to disperse the fat more uniformly. Then the milk is stirred in. This much mixing can be done ahead and held. The two are combined just before baking. To combine, cut and fold liquid into the dry ingredients. Mix only to combine. Batter will be lumpy but no pockets of dry ingredients should remain. The general rule is only 12 strokes. Bake as soon as it's mixed. When filling cups, do not mix batter between scoops. Excessive mixing causes loss of leavening. Sometimes muffins are made using the cake method, i.e. cream the fat and sugar, add eggs, add the dry ingredients and milk alternately. This is more time consuming but produces a lighter, more tender, cake-like muffin. The perfect muffin has a thin brown crust, a slightly rounded top with a pebbled appearance and a moist, even interior. There should be no peaks, no tunnels which are usually caused by excessive mixing and too much liquid (muffin batter should not be fluid). Just because a recipe is in print does not mean that it is in balance. A guide for leavening 2 cups of flour in a recipe is either 2 1/2 teaspoons double acting baking powder, or 4 teaspoons fast acting baking powder, or 1/2 teaspoon soda plus 1 cup buttermilk (for the acid) and 1 1/4 teaspoons baking powder. Excess baking powder and soda taste bitter. Substitute 2 egg whites for one egg in the recipe. If these are stiffly beaten and folded in at the end it will produce a lighter muffin with less fat. Use non-fat milk instead of whole milk. Use salad oil in place of butter. In place of the fat in the recipe, use one-fourth of the oil and replace the other three-fourths with fruit purée such as applesauce. Jars of baby food fruits provide a quick choice of purées other than apple. Adding non-gluten grain products (bran, germ, oatmeal, corn meal) for part of the flour makes a more tender muffin. Begin with the basic formula and change 1/2 cup of the flour to corn meal, bran, wheat germ, rye, oatmeal or leftover cooked cereal. Add 1/2 to one cup chopped apple, dates, prunes, raisins, apricots, figs, blueberries, cranberries, cheese, nuts. Make your favorite muffin mixes by measuring the dry ingredients twice (or more ) into two separate bowls. Use one and package one with the list of wet ingredients to be added when mixing at a later date.